This scanned photo view is kindly provided by Stephen Zvillis and shows CCS23 at Don on 11 June 1984. Six members of the Tasmanian Government Railways' C-class were later rebuilt to the CC class, which featured a higher-pitch Belpaire boiler and the characteristic TGR front-end comprising an extended / self-cleaning smokebox and stovepipe chimney. A later rebuilding variant was the CCS class which added superheating, Walschaerts valve gear and new cylinders to the CC design; C23 was one of four such 'CCS class' locos rebuilt by the Tasmanian Government Railways between 1924 and 1928. Late in its career CCS23 received the Tasmanian Government Railways striking Post Office Red passenger livery. 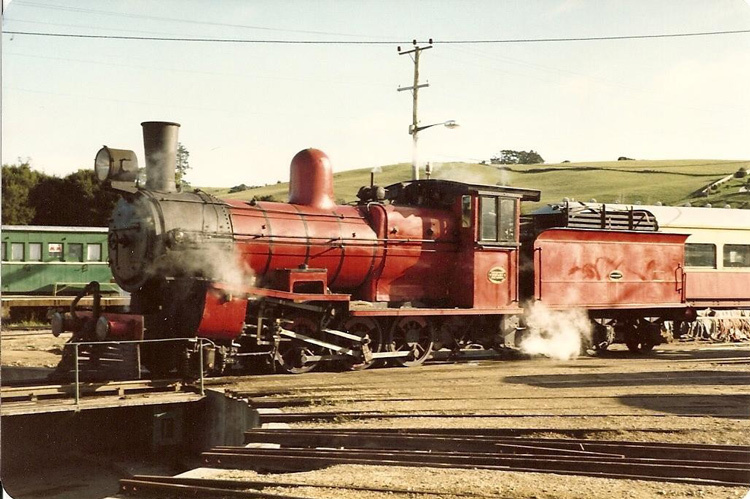 It played a significant role in the 1971 Tasmanian Railway Centenary celebrations and was the last TGR steam locomotive in service when withdrawn in 1975. CCS23 is now preserved as an operating exhibit at the Don River Railway's excellent heritage railway precinct and workshops at Don in Tasmania's north. but is currently under overhaul.